Atmospheric pollen monitoring in the United Kingdom is carried out by the National Pollen Monitoring Network coordinated by the Met Office. The network consists of some, 10 to 20 sites that operate during the pollen season. Counts of pollen grains, differentiated by species, are used to forecast levels of pollen on a regional basis. 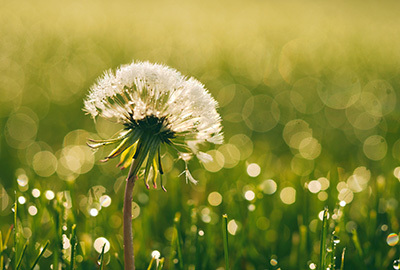 As pollen concentrations present significant variations on the scale of kilometres, this means that at best, pollen measurements are indicative of risk at a regional level. This Pilot Project offers a first step towards statistical estimates of atmospheric pollen concentration by linking pollen and meteorological datasets and using a Gaussian plume model to link with a high resolution land cover map. The Pilot Project provides the tools to compute atmospheric pollen concentration appropriate for use in health studies where estimates of exposure are important. The project has made use of pollen and meteorological data available on MEDMI. The tools are designed to allow compatibility with other input maps to allow researchers to analyse pollen concentrations from different sources. This can also be used to study the effect of future land use change or climate change on pollen concentration in the UK. Four steps were identified for the development of the required datasets and tools. A preliminary step included generic MEDMI Database tools and an implementation of the Gaussian plume model. Step 1 aimed at writing code to combine pollen monitoring data with wind data using the large-time solution for the concentration for a continuously emitting source derived by Thomson and Manning. Step 2 is to calculate deviations from the expected mean pollen count at each monitoring site and derive estimates of pollen emissivity close to each site. Finally, step 3 was to use spatially interpolated emissivity and the large-time solution for pollen concentration to produce estimates of atmospheric pollen concentration for any given day and location. The project developed and provided datasets and tools for MEDMI users towards providing statistical estimates of atmospheric pollen concentrations at any location in the United Kingdom. For the Gaussian plume model, it will be necessary to complete a numerical implementation by passing the correct Python objects with pollen emission values, wind speed and direction, to the function with the plume model. Once this is implemented, it will be possible to test different options for the plume turbulence scale for each species as well as the scaling distance for the deposition. For the remaining deliverables, the Met Office plans to complete the work once a workable spatial coordinate conversion solution has been found and the Gaussian plume model is ready for use. Grass Distribution Map with all species of Poaceae together at 25m resolution for Exeter and surrounding areas.